In total, these account for more than 300 fixes, including a few security and critical ones. 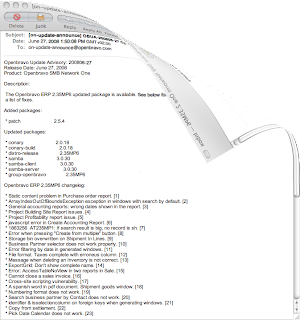 Bugs fixed include those reported by Openbravo Network clients and bugs reported by the Openbravo ERP community. Bugs reported by our clients are treated according to production grade SLAs (Service Level Agreements) to ensure fixes are available on time. For Openbravo SMB Network clients, fixes also include patches for the operating environment, which in many amateur implementations is not well kept up to date, eventually exposing the system to security threats. Before fixes are released, a rigorous quality assurance process certifies there are no compatibility conflicts and they are production ready. For Openbravo SMB Network clients, patches can be easily applied from Openbravo Network’s administration console. Also, because the Openbravo SMB Network One environment is a highly standardized configuration, we can test the patches in exactly the same environment our customers have. This dramatically improves the effectiveness of our quality assurance process, optimizing it for production usage. Overall, this service, recommended for any professional Openbravo ERP implementation, is designed to ensure the system stays updated, bug free and secure.